I fancied that jacket so hard that I went to my local Zara store on the first day it was available after I had seen it on the internet. I haven't seen a jacket like this before, it looks way more expensive than it actually was! Zara is totally killing it this season, every week they release more and more awesome clothes in boho style which are definitely something you won't see that soon again! I love the embellishment the jacket got, its light sky blue/white/cream colors (perfect for spring/summer!) and oversized fit. I can be dressed up or down, it can also look amazing at festive occasions - but I decided to go for the more grungy and every-day-look way, so I styled it with one of my favorite printed crop tops, black denim shorts and western boots. I wanted to keep the rest of the outfit simple, because the jacket already nails every outfit on its own. I did some necklace game here, I forgot how beautiful these two necklaces look together, they're like being made for each other. Are you guys ready for Coachellaaaa? Soon it's that time of the year again when awesome people party in the middle of the desert, in Palm Springs. I'd love to be there, but unfortunately I can't make it this year, too (as always grr..). I always spend the two weekends in front of my laptop, watching the official live stream of the concerts on YouTube and browsing through instagram in order to get inspired by all those awesome outfits the people are wearing there. I really love this festival, it's my favorite besides tomorrowland. Of course there are so many other great festivals out there, too - like Lollapalooza, Ultra, Glastonbury… just to name a few. But Coachella is and will always be the most inspiring one to me! 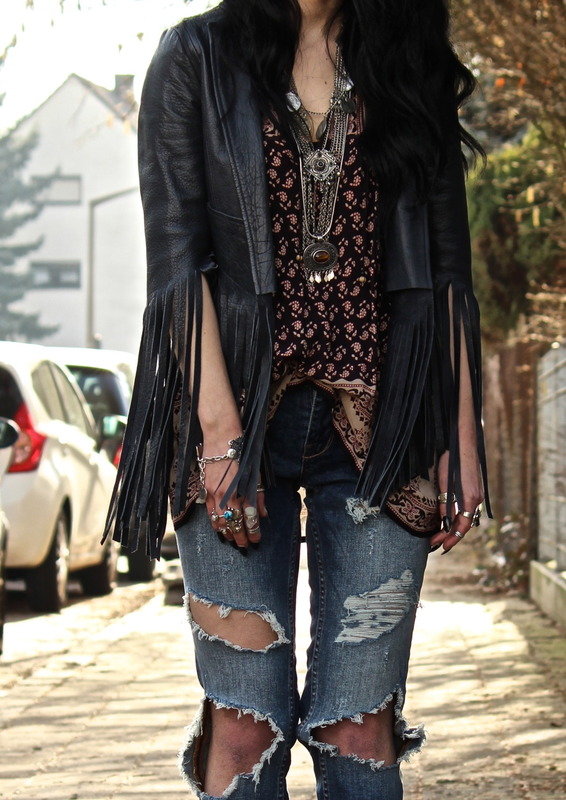 So here is an outfit I would probably wear just like it is at Coachella if I had the chance to be there this year. I don't own that many blouses to be honest, but this one is just perrrfect - I love its colors, print and the way it flatters in the wind. I also love that the design is very 70s inspired, I remember those awesome indian gauze dresses/blouses which have similar wide arms. Wearing blouses with shorts is always my favorite way (especially when they come in destroyed style), especially with a huge concho belt and a lot of tribal jewelry. A biker leather jacket will probably always be an essential basic in our wardrobes, I rarely know anyone who doesn't have at least one of those jackets at home. Leather jackets will never get old and you can never have enough of them - I was really excited about this one when I received it from Banggood - it's made of faux leather, but the quality is still great. I've always loved that blush-pink and black combo, because even though they give almost the total opposite impression (blush = cute, girly & sweet whereas black = mysterious, dark, chic), they work amazingly together. Here I'm wearing my first Spell playsuit EVER, I bought it nearly 3 years ago and I have worn it a dozen times yet. I love those amazing western/tribal symbols and it never gets boring. I also think the blush color suits me pretty well because of my dark hair and my paler skin. I'm always looking forward to wearing my playsuit in summer again. Wish you all an awesome week, guys! Outfit: Live for the journey, not the destination. 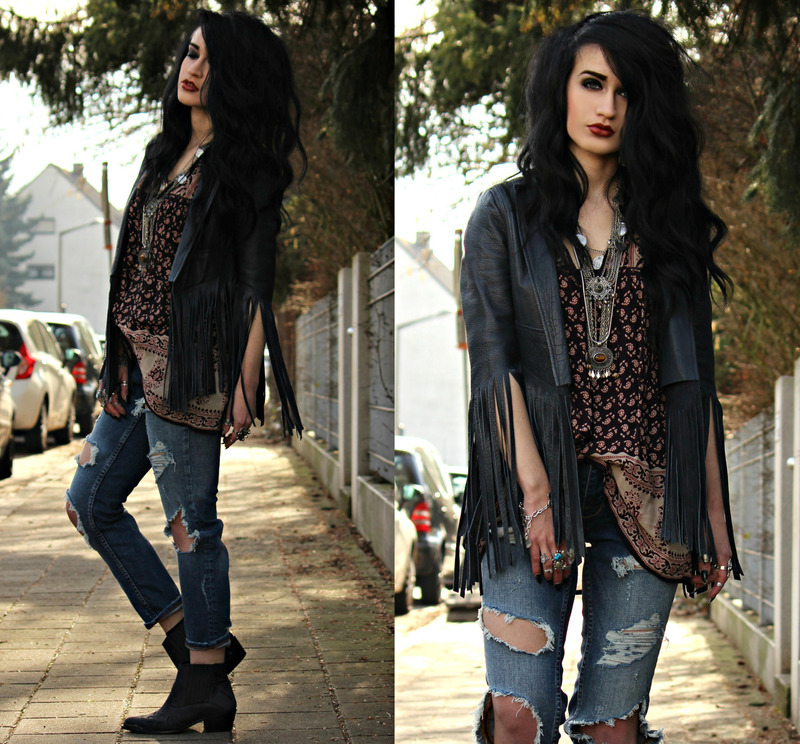 Yay I've been so excited to show you guys this outfit, because it includes my favorite key pieces for spring: Destroyed denim jeans, an indian gauze inspired blouse, my fringed leather jacket and western boots. That combo is perfect for german spring weather when it's getting warmer, but there's still a cold breeze. I'm pretty much into Zara's SS15 collection, maybe I'm even a bit obsessed with it haha. It's so good and it's so me, it's very 70s inspired and the collection is definitely affordable. You all know I usually wear denim shorts instead of jeans, because they're more comfortable and less ordinary. But when it comes to heavy destroyed denim, I can't resist jeans! I hadn't owned a destroyed jeans in blue wash before and I had always been searching for a perfect one until I found this beauty at Zara a couple of weeks ago. It got a typical cigarette fit which is almost skinny jeans - like but a bit more loose. Not as loose as boyfriend jeans are (I mean they look good, but I don't like them on me, because I prefer a tight fitting pair of jeans!). I wanted to create a more laid-back, casual but still edgy look, so I decided to wear my printed blouse and throw over my fringed leather jacket from the Kate Moss x Topshop 2014 collection. I love that leather jacket, because it looks different to the ones you usually see in stores and it's great for warmer weather or even summer, because it's airy. Furthermore the leather is soooo soft! Outfit: You look so Seattle, but you feel so LA. Outfit: We are the ones still swingin'. Inspo & shopping: Dreaming in suede. Outfit: On The Road Again.